For over two decades, we have done our best to make your day-to-day purchases stress-free while still offering everyday reliable value. Over those decades, we have all experienced the evolution of the internet and the impact the digital world. As online shopping became more secure and the world began to expect real-time information, Vitality has readjusted itself. We have introduced many innovative features and security measures to our online business, which set many precedents over the years. Continuing on that trend, Vitality noticed that many of our clients that order online select the same products repeatedly; we wanted to address the amount of time you wasted compiling the same cart. Our ongoing commitment to innovation and seamless interaction with our online ordering process again required us to developing the new benchmark software called Quick List. Quick List is not a wishlist, where products disappear after ordering. You manage what is in your Quick List; products will remain in the Quick List until you delete them from there. Vitality developed the Quick List feature to create a better online experience for our valued clients. Just fill in the quantity of each product you want this time and then click "Checkout." To make ordering even simpler, multiple lists (with unique titles) can be created in Quick List. For example, you can create a list for Patient Products and a list for Clinic Supplies. We hope Quick List brightens your day. As always, thank you for your continued support and trust. If you like the Quick List feature, you will love our “Where to Buy Map” software. Vitality has invested in another tool that helps doctors to promote their clinics and what they offer to patients. Our Where to Buy Map software was custom developed by Vitality to assist clinics across Canada. By adding your clinics to the “Where to Buy Map,” you will enjoy the free benefits of working with Vitality and the potential to reach untapped audiences. 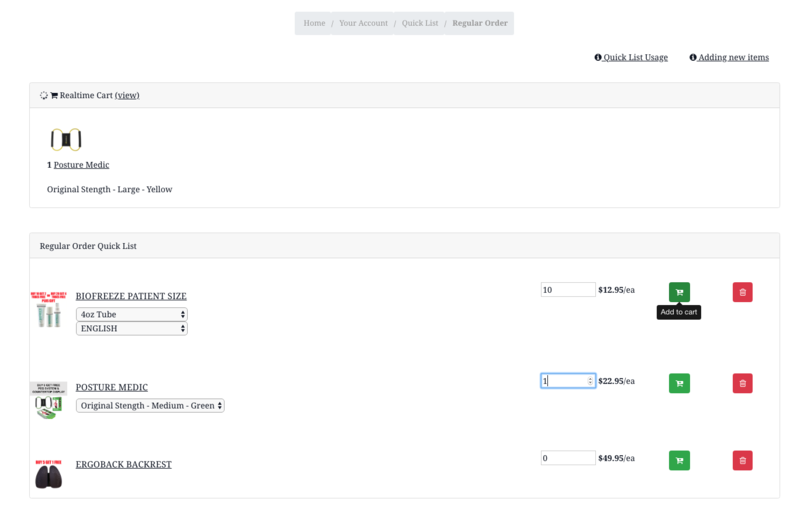 To use the Quick List Function you can start by visiting the product page of an item you would like to add. Below "Add to Cart" is your Quick List button. Click on the small arrow to the right and a drop down will appear. This is where any carts you have created will be visible. If you have none you will have to create one. Click on "Create a Quick list" a pop up will appear that will allow you to end the name of the Quick List you are creating. Click Create Quick List to save and then refresh the page. When you refresh the page your new Quick List will be visible in the drop down list. Click on the Quick List you would like to add the item too to select. Once you have selected your Quick List and the name is displayed on the Quick List Button all you need to do is click "Add to Quick List". You will see a notification in the lower left of your screen to indicate that it has been successful. Now this product will be available to you from your Quick List. Once you have created and added an item to Quick List you can visit it via "My Account" panel. Here you can see your Quick Lists, edit their names, and delete them. You can also add items directly to your cart from here. Click on the name of Quick List you would like to use. Once inside your Quick List you will be able to see all the items you have added. From here you can delete items from the Quick List or use the list to add items to your current shopping cart. Adding items from the Quick List will not delete them so you can repeat this procedure on a later date. If the item you want to purchase has options such as size you can set your preference using the drop down menus next to each item. 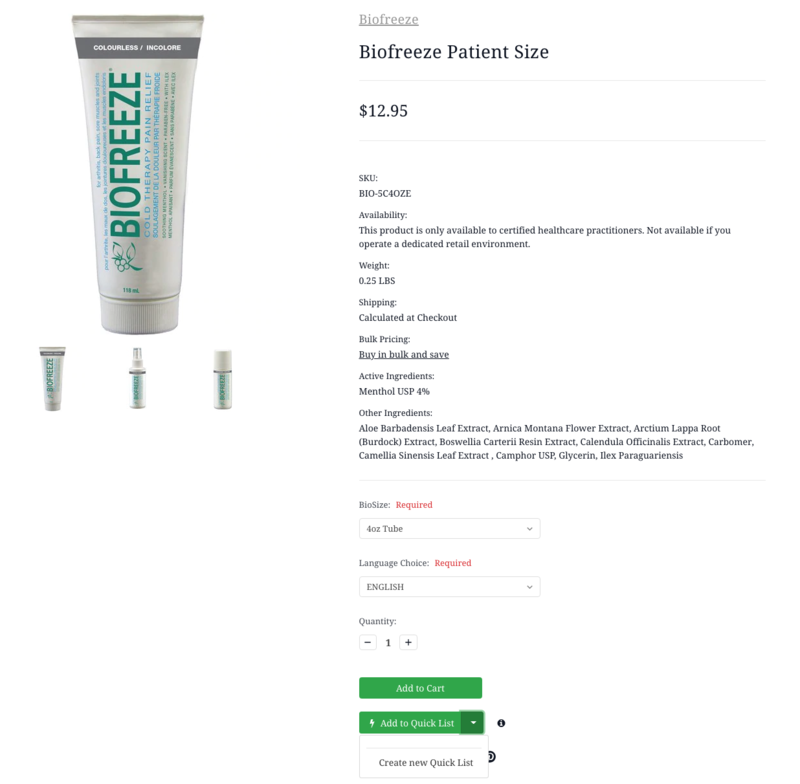 You can add to cart using the green cart button. 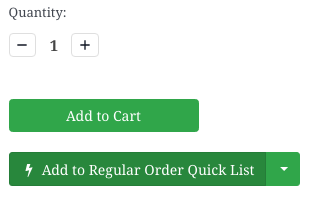 Every item you add to cart will appear in the box above your Quick List. This realtime cart will show you everything that has been added including promotional items and items that were not added via Quick List so you always know what you have in your cart. You will also be able to see the quantity. 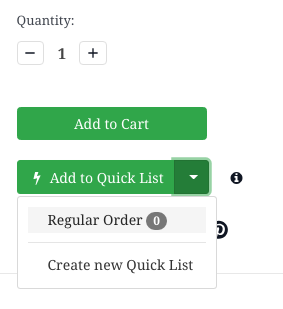 Once you build your Quick Lists you will be able to quickly add items and complete your checkout without having to search the entire site.